C-176 is a strong and covalent mouse STING inhibitor. H-151(H151) is a novel STING (stimulator of interferon genes) antagonist. Cridanimod is a potent type I interferon (IFN) inducer that directly binds to STING and triggers a strong antiviral response through the TBK1/IRF3 route. c-GpAp is a potent STING ligand. 2’2’-cGAMP is a synthetic STING agonist. DMXAA is a vascular disrupting agents (VDA) and competitive inhibitor of DT-diaphorase with Ki of 20 μM and IC50 of 62.5 μM in cell-free assays, respectively. ML RR-S2 CDA (STING-Inducer-1) is a highly active cyclic-di-nucleotide immune stimulators that activate DCs via the cytoplamtic receptor STING (Stimulator of Interferon Genes). ML RR-S2 CDA ammonium salt is a synthetic cyclic dinucleotide derivative that functions as a highly potent agonist of STING, enhances binding affinity to STING and activates all known human STING alleles. 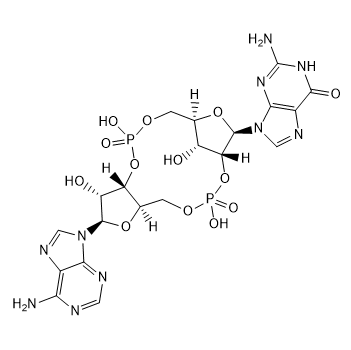 2′3′-cGAMP is a potent STING activator that binds to STING with Kd of 1.61 uM.